If you are searching for a spacious but strong room to your pretty birds, please take our bird cage into account. Durable aluminum frame construction features superb shock, rust, corrosion, tarnish resistance, which prolongs the service life of the cage. All aluminum netting construction is ventilate, providing a large sphere of vision in your birds and making them be at liberty. There may be 3 gates that simple to open and get into for the aim of feeding, enjoying, it’s also safe when in closed condition. 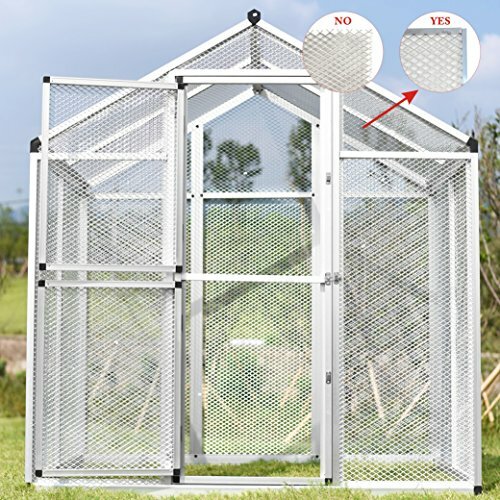 This bird cage, w4 pegs for extra toughen on the same time we attach a couple of glove for you.